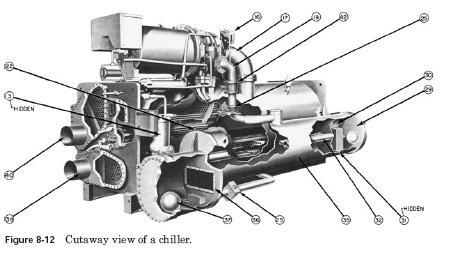 Chiller is a part of the condenser. Coolers are used for cooling water or in brine solutions. Refrigerated (chilled water or brine pipes evaporators. This cools the plot on which the evaporators are located. This type of cooling, using chilled water or in brine, can be used in large air conditioning systems. It can also be used in industrial processes, where cooling is required for a particular operation. Fig. 8-11 illustrates such an operation. Notice how the compressor is located on top of the condenser. Coolers response to demands from 200 to 1600 tonnes of refrigeration. They are used for process cooling comfort : air conditioning, power stations cooling. In some cases, they are used to provide ice for ice rinks. The arrows in Fig. 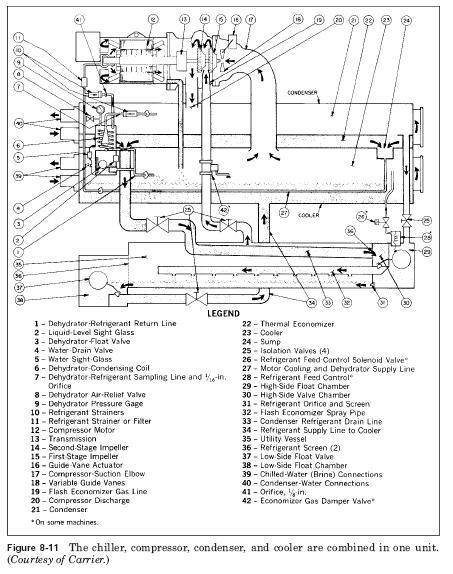 8-11 indicate the flow of refrigerant and water or brine flow through a large pipe. Fig. 8-12 shows the machine in the context of view. The following explanation of the various cycles will provide a better understanding of the operation of this type of equipment.